FOREVER STILL // Do Metalheads Dream of Electric Sheep? Megacorporations controlling the peoples’ every move and environmental collapse—when Blade Runner hit our screens back in 1982, no one would have ever believed that the dystopian 2019 it portrayed would be so similar to the world we live in today. But it is. That’s exactly what inspired Danish alt-metallers Forever Still to create Breathe in Colours. Ahead of its release, we caught up with frontwoman Maja Shining to chat about the record, and the band’s plans for 2019. Hysteria: Tell us a little about the band and how you got started. 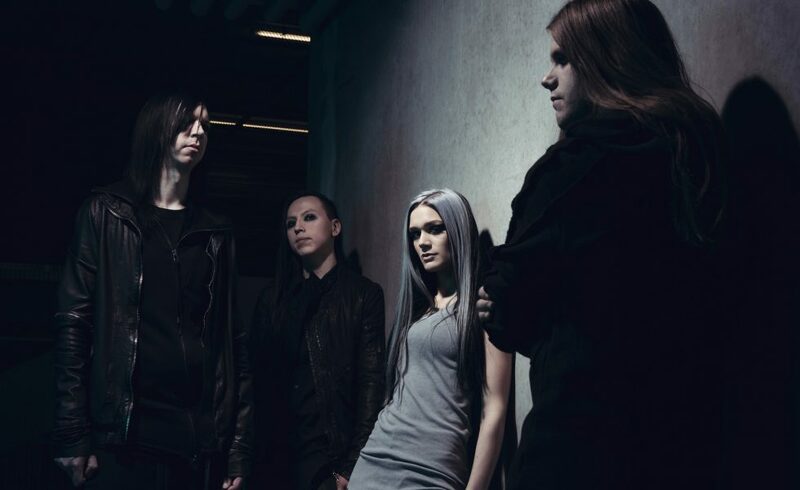 Maja: In short, the band was started by Mikkel Haastrup (bassist) and me. We met at a show and started talking about making music together. In 2013 we put out our first EP and now we’re in 2019 with our second album about to come out! How did working on this record compare to your first one? I quite enjoyed it. The setting was a little different as we didn’t have an apartment at the time, our apartment block was being renovated so we had to get out and find something different. We rented this small room where we just brought the essentials like a drum machine, a guitar and a microphone. It was a really basic setup but it really helped us focus on the song writing and the essentials and not this whole big production around it which was really cool. You’ve always been a band that’s handled everything on your own, what made you decide to bring your live drummer into the studio with you this time around? We’ve been playing with Rune Frisch (live drummer) for about three years now, and we’ve done some real big tours together. On our last album we just didn’t know him. At this point we were very familiar with his style of playing and his energy and we’ve become very close friends so it was only natural to bring him into the studio. I think the results speak for themselves. Can you explain the dystopian themes that influenced this album a little more? Well for us, our main inspiration was just watching the news and seeing how the world is today with the government in the pocket of big companies and the climate doing absolutely terribly. You know, there’s a lot of fear that’s preached so we close our walls around ourselves and exclude ourselves and that reminded us of those 70-80s dystopian novels where they looked into the future and they didn’t see this shiny, pretty thing. They saw the future more like it is today. There are so many things that are quite similar to how they imagined 2019 to be, Blade Runner is set in 2019. It’s kind of crazy but a lot of these dystopian things have come true. The album’s got a pretty interesting front cover, can you explain how it ties into the lyrical content? At first glance I guess it appears a little dark and gloomy but in reality it’s bursting with colour, like the real world we just have to make the effort to find it. With this whole dystopian thing the world can seem a little dark and grey but there’s so much colour to find and that’s what we wanted to represent with the album artwork. We put the binary code behind me, it’s computer language and it spells out all the colours in the entire world. In fact the album cover is actually the most colourful one you could find (laughs). In recent years you did two Europe tours alongside Children of Bodom and Lacuna Coil, what were some of your favourite moments from those tours? It’s funny you mention it because just yesterday Mikkel put on The 119 Show (Lacuna Coil’s Live in London album), they played Nothing Stands In Our Way which was actually the final song they did on the tour we were on. We crashed the stage with the other support bands (laughs). We sang that entire song with them, so when I watched The 119 Show I just got the emotion back and that feeling back. It was a really fun night. Did you pick up any tips or tricks from those shows that have helped the band grow a little more, especially on this new album? The Lacuna Coil tour was the first big tour for us, we had some little five day runs on our own but this was the first time we were out for a couple months. Mostly what we learnt was its really not that big and scary at all. We were confirmed for the tour a month before it started and at that time everything was so chaotic and I was so nervous about everything we had to figure out, but when we got there everyone was so nice, friendly and open and everything was so structured. What are some things you’re really hope to achieve this year? We haven’t been touring for a while because we’ve been focused on writing the new album, as one does. Our main goal is to just get out and tour Breathe in Colours. It was very much written to be performed live, we’ve brought a lot of new elements to the table and we want to bring them out to the live shows and really expand on them. We’re really excited to get out on some good tours and share that with the world. The screams you brought to this new album are going to be insane in a live setting! Thank you so much! It’s something that’s developed on the past couple of tours. We didn’t have the songs for it but I kind of just started naturally implementing it on the older songs because you get a different energy from it. It was only natural I brought that on the album and it has a done a great deal to make the album something a little different. Breathe In Colours drops 29 March through Nuclear Blast.